17872 Lance Corporal Francis Hedley, 7th Battalion, Alexandra, Princess of Wales’s Own Yorkshire Regiment was killed in action 13 May 1917. 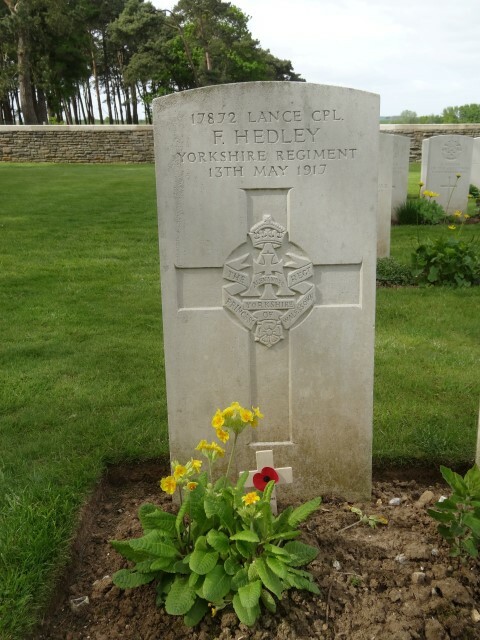 He was 22 years old and is buried at the Canadian Cemetery No.2, Neuville-St.-Vaast, France  and commemorated on the St. Helen’s Colliery Memorial Cottages. All were born at St. Helen’s other than Jacob who was born at Etherley Dene, Bishop Auckland. In 1901, the family lived at Etherley Dene and Robert worked as a coal miner (hewer). By 1911, the family lived at 1 West View, Tindale Crescent, Bishop Auckland. Robert was working as a coal miner and sons Robert and Francis worked at the brickworks. Sometime later they lived at 20 West View. The service record of Lance Corporal F. Hedley and the war diary of the 7th battalion, Yorkshire Regiment, popularly known as the Green Howards, have not been researched. 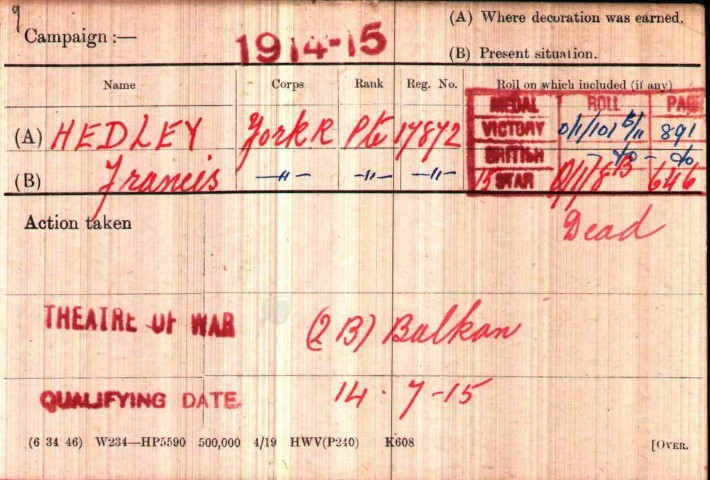 His medal card indicates that he entered the Balkan Theatre 14 July 1915. If that is the case then he must have served with the 6th Battalion, Yorkshire Regiment which came under the orders of the 32nd Brigade, 11th (Northern) Division and served in the Gallipoli Campaign of 1915. The Division left Liverpool 30 June 1915, arriving at the Greek island of Mudros just off the Turkish mainland 10 July and invaded the Gallipoli Peninsula at Suvla Bay 6 August. This was a bloody and costly affair which gained little. The offensive was called off and the battalion was evacuated 19/20 December 1915. The Division landed in France in July 1916. The main thrust of the Allied spring offensive was to be launched on the Aisne 16 April 1917 by the French. Commonwealth forces were to begin a diversionary attack at Arras a week earlier with the aim of drawing German forces north. This offensive began 9 April on a 22½km. front following a 5 day artillery bombardment by 2,800 guns. The 14 Commonwealth Divisions outnumbered the enemy but having withdrawn to the heavily fortified Hindenburg Line in the spring of that year, the German defences were strong. In the north, the 4 Divisions of the Canadian Corps fighting side by side for the first time suffered heavy losses but scored a great victory with the capture of Vimy Ridge. In the centre near Arras, there was an advance of 5km. but south of the river Scarpe, very little progress was made and the Australians suffered many casualties at Bullecourt, 11 April. 1 – 2 May 1917: The Brigade moved back to Arras. 9 – 11 May: The 17th Division took over the front held by the 9th Division in trenches north of the Scarpe. 11 May: night, “B” & “C” Companies moved into Clover Trench and “A” was in Cushion Trench then “B” & “C” moved forward to new assembly trenches with “A” & “D” taking their place. 12 May: 6.30 am, the 4th and 17th Divisions joined an attack along the whole front. The objective of the 17th was to advance to Cupid, Curly and Cash Trenches then onto Charlie Trench. The 50th Brigade operated on the right with 7th Green Howards on the right and the 7th East Yorks. on the left. “The attacking companies went forward under a very effective shrapnel barrage in two waves of two companies each “B” Company on the right of the first wave and “A” on the right of the second, each wave being composed of two lines. “A” and “D” Companies detailed a mopping up party, consisting of one officer and 30 men from each, to clear Crook Trench which ran roughly at right angles to their objective. Dust and smoke from the barrage made observation impossible once the attack was launched. This situation was confirmed by 2/Lieut. Collins. At 10.30pm 2/Lieut. Fox led a bombing attack and established a block in Curly Trench, north of the junction and, after encountering very heavy opposition eventually succeeded in occupying the junction. 14 May: 4.00am, remnants of “A” Company withdrew to the Fampoux-Gavelle line and were relieved by the Dorsets. The 3 remaining companies stayed with the Dorsets to which they were temporarily attached being heavily shelled by 4.2 and 5.9 inch shells. 15 May: 2.30am, “B”, “C” & “D” Companies were relieved by a company of the 7th Lincolns of the 51st Brigade. The Battalion had gone into the trenches 9 May with 18 officers and 436 Other Ranks and came out 15 May with 5 officers and 228 Other Ranks. “For most conspicuous bravery and devotion to duty. Private Dresser, in spite of being twice wounded on the way and suffering great pain, succeeded in conveying an important message from Battalion Headquarters to the front line of the trenches which he eventually reached in an exhausted condition.